In the early 1990s, Harold Brown entered into what was then the largest real estate Chapter 11 bankruptcy in history; he was forced into a Chapter 11 by 33 banks. Brown chose to share the process with one journalist pledged to secrecy until Brown's attorneys agreed the information could be released with no possibility for repercussions. After three years only three of the banks survived, along with Brown. Brown not only survived, but also rebuilt his company into what is today an estimated $1.3 billion. Brown's story is being published for the first time as told to veteran real estate columnist, Bob Biederman in his new book, Marbles. This incredible story is just one of 21 told in an uncompromising look at morality and mortality by a writer who questions the former and taunts the latter. In other chapters, the survivability of Israel is questioned through the eyes of a 61-year-old sabra cousin living in Tel Aviv with memories of her participation in every war fought on the purportedly sacred soil of Eretz Yisrael. There is the story of the day a father comes home to find his teenage son dead of self-inflicted gunshot wounds from the guns his father had kept under his bed. The father is three-years sober and a survivor of his own father's suicide. How do families deal with open adoption? What toll does crohns disease take on a young girl and all those who care for her over the years? The author leads you through the connections between 50 Shades of Grey, the Arab Spring and a condo boardroom. Then he takes a look inside the history of Casey's Diner in Natick, and the dark streets of Waltham from the eyes of a Nighthawk cabbie. Death is near and too often faced and experienced. 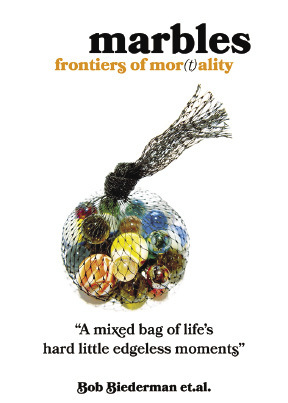 Moral judgments during those experiences define the author and his bag of Marbles, now on sale through Amazon and www.RobertBiederman.com.